With almost two decades of working in conflict zones like Iraq and Syria, Jeremy Courtney has come face-to-face with ISIS, suffered U.S. airstrikes, spent jail time in Iraq, and had fatwas calling for his death. And yet, he's learned to love anyway. Nowadays it seems we are all afraid. We fear wars and injustice, government policies and economic ruin, tragedies and the loss of those we love. Our hearts tell us a better world is possible. We can imagine it - and almost taste it - but do we dare reach beyond our fear for it? Could it be that the extraordinary, meaningful lives we dream of aren't found in clinging to what we have, but in walking toward the very things that scare us most?Founder of Preemptive Love Coalition Jeremy Courtney knows better than most that the world can be scary as hell. With almost two decades of working in conflict zones like Iraq and Syria, Jeremy and his team have come face-to-face with ISIS, suffered U.S. airstrikes targeting the team, spent jail time in Iraq, had fatwas calling for Jeremy's death, and yet learned to love anyway - despite being afraid. Gut honest, Jeremy shares his own journey, taking readers inside the heartbreak - and the joy - he and his family have experienced along the way. 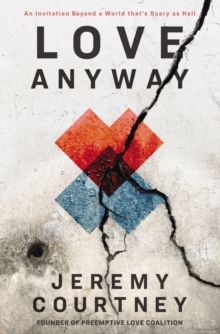 With raw accounts of living with real people amid bombings, war, and terrorism, Jeremy opens the door on what he has experienced and his struggle to understand what it all means. Love Anyway will inspire you to confront your deepest fears and live the courageous life open to you on the other side of fear. By finding ways to respond to our scary world with the kind of love that may seem a little crazy, we can become agents of hope who unmake violence itself and unfurl the more beautiful world our hearts know is possible.